Location: Takasaki City, Gunma Pref. In Japan the word daruma, derived from the Sanskrit word "dharma," originally referred to Bodhidharma, the founder of the Zen sect of Buddhism. In recent historical times the term came to be used for dolls in the shape of the founder performing zazen meditation. From the head down, the dolls are painted as if they were wearing a red robe. The zazen posture is one with the legs folded under the body, and the meditation involves clearing the mind of distracting thoughts to achieve a mental state which is totally free from trouble, in an attempt to recognize the truth by mental concentration. Today daruma means a small doll made from papier mache, which is thought of as bringing exceptionally good luck, since it always returns to its original position even if knocked over. People think that if they face a difficult situation, whatever hardships they endure, as symbolized by the doll that always returns to its original position, they will always bounce back. Dolls are acquired at various stages during one's life, or when facing some kind of challenge. Dolls are sold without the eyes painted in. The custom is to make a resolution and paint in the left eye of the daruma. If the challenge is successful the right eye is then also painted. At election times it has become a custom for politicians to do this, and it is a common sight to see the smiling elected candidate painting in the remaining eye in front of the supporters. Daruma-making in Takasaki began in the late 17th century as a relief measure for farmers who were suffering from famine. The story is that the Daruma Temple instructed farm households to make dolls from papier mache as a way of earning extra income. These days nearly 100 households annually make about 1.6 million darumas, and 80% of the darumas made in Japan. Every year on the 6th and 7th of January a daruma market is held in the precincts of the Daruma Temple, and hundreds of thousands of people visit it. 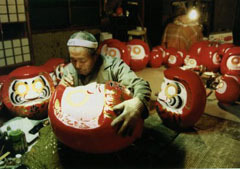 Photo: Making daruma (Gunma Prefecture).